Hey! Guys, today am going to reveal a very amazing tip for worldwide users about how to send blank messages on whatsapp to your friends. Now you can send totally blank messages on WhatsApp by using No Word app. 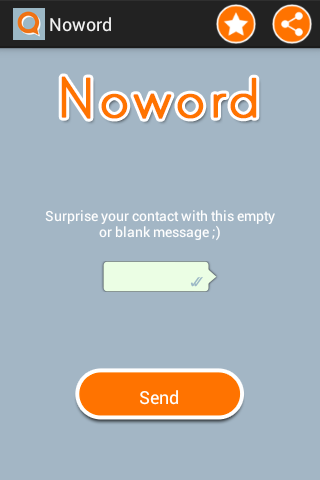 First of all Click Here to download 'No word' app on your android phone from playstore. Once the app gets downloaded open it and click the send button,then whatsapp will show you the list of contacts,choose a contact to whom you want to send message and click on send button. This App is no More available in INDIA. That's All. Your blank message will be sent. A Trick to Send Blank Messages on Whatsapp Without using any App. 1. Open Notepad on your PC (computer). 2. Type ALT+255 now it will create a blank space in your file and you will be able to save that file. 3. Now send that file to your Android phone. 4. Open that .txt file and copy every from that file (You will see everything blank but you still have to copy). 5. Now paste that in your Whatsapp and send. Still have any problem then let me know. Message: I hope that you have enjoyed 'Send Blank messages on Whatsapp by using No Word App]' article. However, if you want me to deliver more articles then please share my post. You can use Social Sharing Widget provided at the end of every post. After all, Sharing is Caring!. I will check it and update the post soon. Post updated. Read it again and try the latest method updated in this post. I did that possessor but I cannot open that Notepad file in my android device. Actually I opened into the third-party app. But there is showing “?” so I cannot send Blank space on what sup. So Please Give me Clarification about that “How to we can open that Notepad in the android office. I am also using what'sup on PC & i also use this method ALT+255 (Blank sms hass been created in notped) but i can not send this blank sms to anyone by whats'sup so can you suggest me that what we need to do?